Deinze is a rather moderate town with about 30000 inhabitants. There is a youth centre where lots of activities are organised. There are lots of cafes and places to go out. There is also a train station and lots of busses with connection to Ghent, the closest big town. Brussels is about 45 minutes away. In Deinze, there are a lot of youngsters and organisations the volunteer can participate in. AFS, the coordinating organisation, will provide a host family for the participant, as we strongly believe that this is the best introduction to the Flemish culture and a great opportunity to integrate in the local community. The host family will provide lodging and food. They will be living close to the project and will be Dutch-speaking. AFS encourages the host family to use Dutch as a communication language with the volunteer, to help him/her to practise the Dutch language. All weekdays : (general) Helping with the education and nursing of people with a mental handicap. – 10 %: entertaining the people in their free time (eg. the moments where disabled people are waiting because the educators have to wash or feed another child/adult. ): this can be done with the toys already made by the centre or with little games. The people working in the centre have experience with this and can help out the volunteers with this. The volunteer can also use certain workboxes that the centre developed (working with certain themes, eg. Sound, Touching, etc.). The volunteer can, if he or she is creative, develop own boxes, together with the disabled people from the centre. Helping to create toys, which are easy to handle for people with a motor/mental handicap. – 15%: helping in a class (children) or activity group (adults). – 10% attending meetings, planning activities (while the people are resting). – 25 % supporting activities: Snoezelen (Dutch word, non translatable, but means: working on the senses of the people with light, sound, touching, etc. 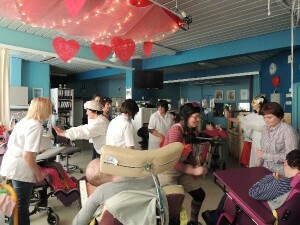 The centre developed an own ‘Snoezel’ room with all sorts of equipment), walking, swimming, horse-riding, riding with bicycles, massages, music (listening to relax, or even playing instruments), cooking, … The organisation has its own activity groups where occupation therapists work with the people with a handicap on a professional basis. In holidays:giving more activities (no class anymore) & when the weather is good : lot’s of walks, bicycle rides,.. Within the last two parts (supporting activities and general activities), the volunteer can develop a personal project. There are occupation therapists and staff members to organise those activities, but when the volunteer feels comfortable after a while, he or she can develop something personal. He or she will get time and space to do this. AFS, the coordinating organisation, will provide Dutch language lessons for the volunteer. These lessons will be given by an experienced teacher and will be organised in a central place that is easy to reach by public transport. The lessons will be organised weekly in the first weeks of the project.